Comments by Dr. Manmohan Singh Honourable Prime Minister of India in 2002 at Kajal Nalwa's first solo exhibition.
" This is Kajal's first exhibition. It is indicative of the great promise and potential her work holds for contributing to the world of art and culture. The theme of the exhibition, highlighting concern for the environment and nature and our women's role in preserving our ecological heritage are theme's of great contemporary relevance and significance. My best wishes for the future. May your path be blessed ." Kajal Nalwa, has been painting for as far back as she can remember. Born in Kolkata, India she moved with her shipping family to Chennai and then Sri Lanka . Kajal spent eight years at The Lawrence School Sanawar, a beautiful school in the hills of Himachal Pradesh. 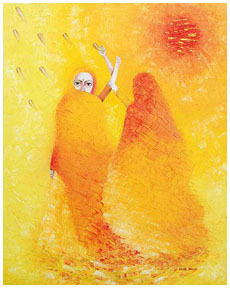 Kajal Nalwa is one of the few artists in India who have carved their niche in the field of painting. Her style of painting not only includes ordinary paintings but figurative paintings, landscape paintings and flower paintings. Kajal Nalwa, has been painting for as far back as she can remember.Born in Kolkata [India] she moved with her shipping family to Chennai and then Sri Lanka. Kajal spent eight years at The Lawrence School Sanawar, a beautiful school in the hills of Himachal Pradesh where art was her subject. She then attended college at Sophia Polytechic Mumbai, where she studied Textile Design. Marriage to an Army Officer, took her to all corners of India. This has had a major influence in her work as varied aspects of the country formed an unconscious impression on her. Kajal,uses the medium of water colours and oil on canvas solely using pallete knife.The main theme of her work is nature,using colour to translate nature into an art form.She likes to show women in harmony with their natural surroundings and she also does landscapes. 2006 At Art Entrance, Mumbai. 2005, 03, 02 At Lalit Kala Akademi, New Delhi. 2004 At India International Centre, New Delhi. 2000 At Art Folio, Chandigarh. 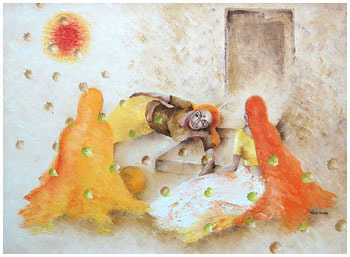 2005,04,03,02,00, 1999 At Art Junction, New Delhi.